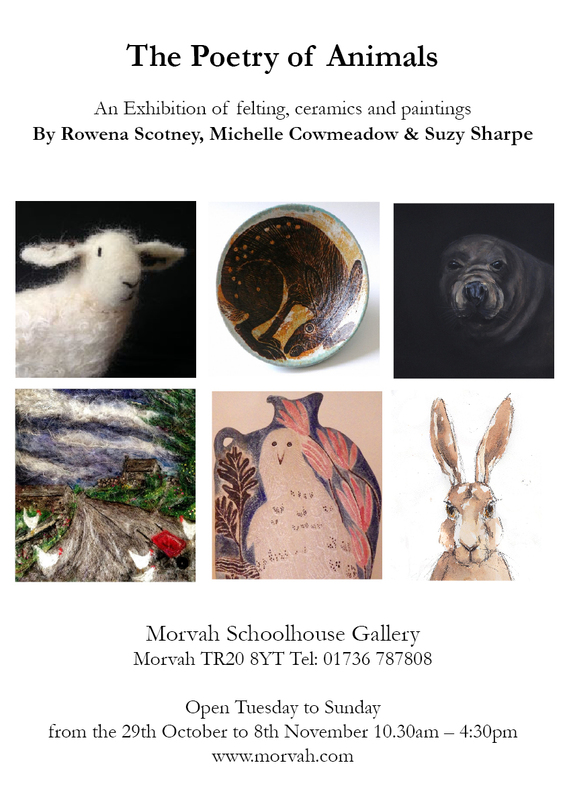 A few months ago I was delighted to be asked to take part in an exhibition with Rowena Scotney and Michelle Cowmeadow at Morvah Schoolhouse Gallery. We set up tomorrow and the show is open to the public from Thursday, with music and nibbles on Sunday 1st November. As the woodlouse replied to the poet, ‘Can I close dead ears against the rush and resonance of things? …I am likewise the created, – I the equipoise of thee’. The exhibition is a poetic celebration of animals, both as metaphor for the human condition (as expressed in the many poems which inspired the artworks here) and for the creatures themselves, with ideas explored around experience, curiosity, journeying, growth, transience, life and death. Some of the artworks also communicate the delicate balance and bond between human and animal and how this is disrupted via threat and survival in nature. From the universal to the tiny insect, with seriousness and with humour, the exhibition aims to celebrate the cosmic life force and energy which suffuses us all, unravelling, as the poet Mary Oliver expresses in ‘Wild Geese’, ‘[our] place in the family of things’.